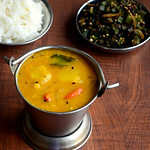 Pumpkin sambar is my recent try in pumpkin recipes. Usually I make red or yellow Pumpkin gravy or pumpkin poriyal ( Manjal Poosanikai/Parangikai in Tamil, Mathanga in Malayalam, Kumbalakayi in Kannada, Kaddoo in Hindi) – My mil’s recipes for our lunch. Both are my favorite recipes. But Sendhil doesn’t like them. So I have to make some other kuzhambu or side dish specially for him whenever I cook Pumpkin. 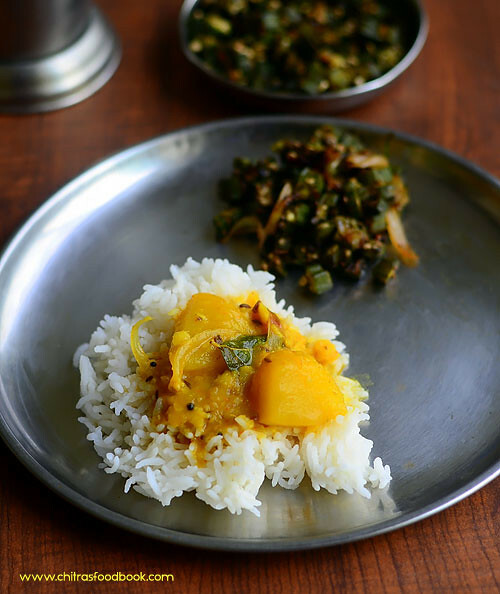 Recently he suggested me to try pumpkin sambar for rice instead of making other dishes with it. Usually I add few pieces of yellow pumpkin in my hotel idli sambar recipe to get the mild sweetness. But this is the first time, I am making manjal poosanikai sambar for rice. So I asked the recipe from my MIL, combined it with my mixed vegetable sambar recipe and made it for our lunch along with Vendakkai poriyal. Sendhil liked it very much and ate all the pumpkin pieces happily.He told sambar tastes much better than pumpkin chutney and poriyal . Abbaaa, I am feeling relieved that I can make him eat pumpkin with this sambar recipe . 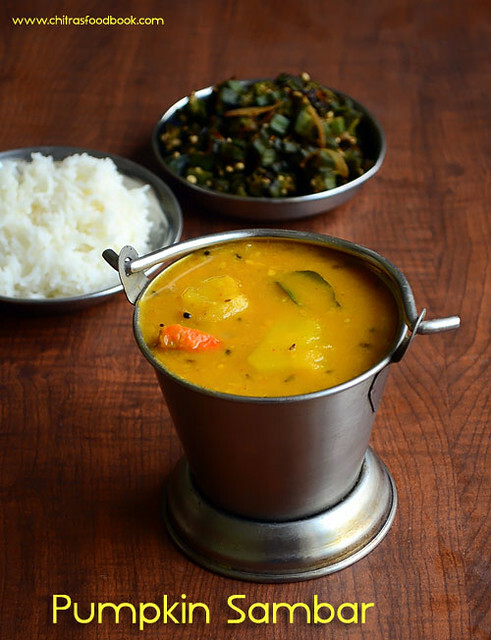 Friends, do try this easy and yummy poosanikai sambar/pumpkin sambar for your lunch. You can have this sambar with idli,dosa too. Ok, lets see how to make it with step by step photos ! Soak tamarind in 1 cup of warm water for 15 minutes.Wash and soak toor dal adding 2 cups of water, turmeric powder and cooking oil. Wash and peel the skin of pumpkin and cut into big sized cubes as shown in the pic below. You can also chop it with skin because skin becomes soft after pressure cooking. Take the pieces in a small bowl that fits in the cooker and keep it inside the cooker without adding water. Let the dal pressure cook for one or two whistles in very low flame. Open the cooker after the steam is released and remove the pumpkin bowl. Mash the dal well with a ladle. Chop the onions, slit green chillies and keep it ready. In a kadai, heat oil and temper mustard seeds, methi seeds.Once they start to splutter, add the urad dal, cumin seeds, pinched red chilli and curry leaves. Add sliced onion, slitted green chillies and saute until onion turns transparent. Now add 1 cup of tamarind extract, sambar powder, dhania powder, turmeric powder, salt and cooked pumpkin pieces. Add raw hing and few torn curry leaves while the sambar boils. Let it boil for 5 minutes. Add 1/2 cup of more water in the middle if needed. Now add the cooked & mashed toor dal. Mix well and let the sambar boil for another 3-4 minutes or till the desired thickness is reached. Switch off the flame and transfer the sambar to a bowl.Garnish it with coriander leaves and add 2 tsp of ghee.Cover it with a plate and serve after 30 minutes standing time. Mix with hot rice and enjoy with any poriyal and appalam ! The spiciness level would be normal for this sambar. If you want more spicy sambar, add more green chillies or some red chilli powder along with dhania powder. You can use red pumpkin or white pumpkin too. But chop them into big pieces so that it doesn’t become mushy while pressure cooking. Never cook pumpkin pieces along with dal. Keep them in a separate box inside cooker but do not add water. This helps to cook the pumpkin soft and it retains its shape too. 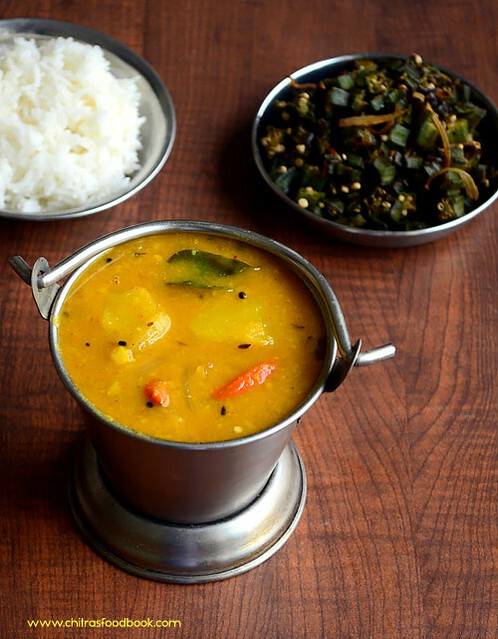 Enjoy this yummy yellow pumpkin sambar with plain rice and poriyal.Tastes yumm !! Never prepared sambar without tomato!! Shall try this method once!